If you do not want your customers to be able to request a video version of their tours, and/or do not want them to be able to connect their YouTube account you've come to the right place. This article will walk you through disabling this feature for your clients as well as removing the ability for your customers to connect their YouTube accounts. Please note, if you remove the option for your customers to request a video, you can still create a video for them, however they will not be able to access it in their client panel. If you remove the option for your customers to connect their YouTube account, you can still create a video for them, but it will not automatically send the tour video to YouTube. 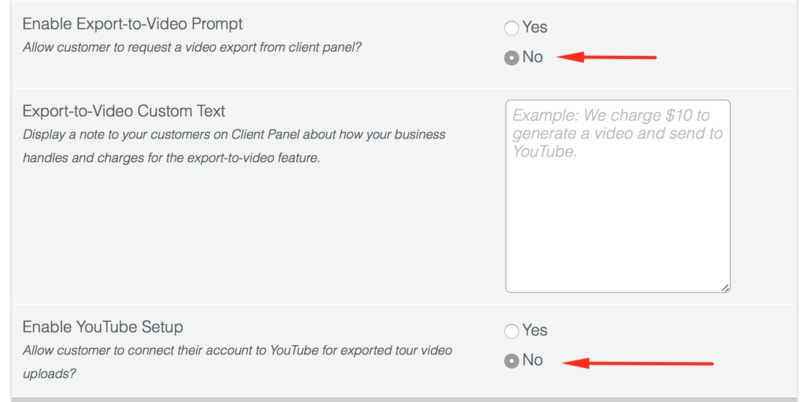 Once you are in your account settings, on the right side of the page, click on the option that says "Client Panel Options"
Find the setting that says "Enable Export-to-Video Prompt" and set this to no. If you still want to give your customers the option to connect their YouTube account, then you are done. Hit save at the bottom of the page. In turning this feature off, to avoid any confusion, it may also be helpful to disable the ability for your customer to connect their YouTube account. You can find this option below that says " Enable YouTube Setup" and select no for this as well. Click save once finished. Once complete, your customers will no longer have a video tab, and will no longer be able to request a video, or see the option to download videos in their client panel.